I found more fun stuff for game addicts in technabob. Tetris was the first puzzle game I played on the computer. My first game had not even colours. 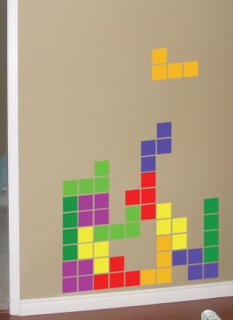 Now I could decorate my wall with Tetris blocks. The set of vinyl stickers can be arranged the way the decorator likes. The set has 7 colours. Tetromino, also spelled tetramino or tetrimino, is a geometric shape composed of four squares, connected orthogonally. This is a particular type of polyomino, like dominoes and pentominoes are. The free tetrominoes additionally treat reflection (rotation in the third dimension) as equivalent. There are only five free tetrominoes: I, L, O, S, and T.
The fixed tetrominoes do not allow rotation or reflection. There are 2 distinct fixed I tetrominoes, four J, four L, one O, two S, four T, and two Z, for a total of 19 fixed tetrominoes. Thanks for visiting my blog. Really appreciate it. I used to addict to tertris too. It is so interesting. But now, the only puzzle game I play is Rubik's Cube. I love Tetris too! It's been around for ages but still it's one of the best puzzle games ever. Finnish metal music doing good!